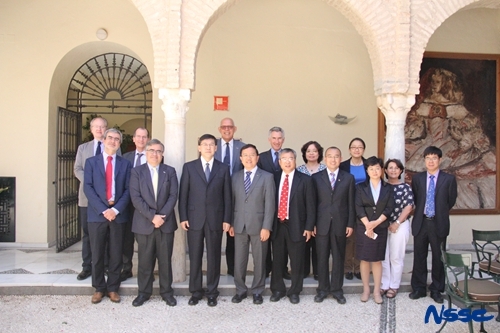 On May 20, 2015, the 11th ESA-China Space Science Bilateral Meeting was held in Cordoba, Spain. The meeting was organized by the Directorate of Science and Robotic Exploration of the European Space Agency (ESA). Mr. Alvaro Gimenez, the Director of Science and Robotic Exploration of ESA, welcomed the Chinese delegation and stressed that the ESA-CAS cooperation is based on successful long-lasting ESA-CAS relations. Dr. YIN Hejun, the Vice President of CAS, attended the meeting and delivered an opening speech. When touching upon the ESA-CAS joint mission, he said "the joint mission, representing in-depth cooperation starting from the mission definition, will take us into a new stage of ESA-CAS cooperation and a vigorous and sustainable cooperation channel between us will be reinforced." Mr. Alvaro Gimenez presented a report on the status of the present space science program at ESA, which was followed by a report of Dr. WU Ji, Director General of NSSC, on the status of CAS Strategic Priority Program on Space Science. The bilateral meeting mainly focused on the selection of proposals of ESA-CAS joint mission which is agreed upon in 2013 during the 9th ESA-China Space Science Bilateral Meeting. Both sides engaged in intensive discussions on the selection of mission proposals which is submitted by a Senior Science Committee and reached consensus to submit one mission proposal to respective decision-making bodies. 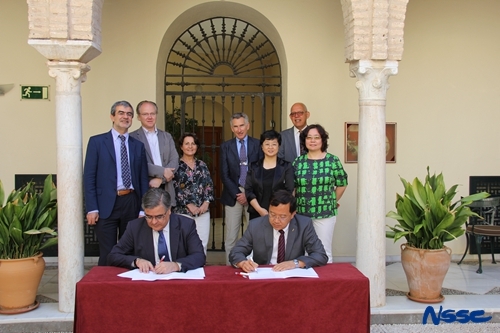 Both sides signed the minutes to formalize the bilateral cooperation and agreed that the 12th ESA-China Bilateral Meeting will be held in May 2016 in China.